The Hoban Horse – Fly on the back of Metal Horse! The Hoban Horse, designed for the 7th Dragoons during the Evanglessian Civil War, was a marvel of technology for its time. Designed by Anketin Barnwell Hoban, this convenience was a steam-powered flying mount designed for his Dragoon unit in order to allow them the ability to attack not only targets on the ground, but to also raid and harass targets in the air. This mount is primarily designed to give the rider the feeling of riding a normal horse. Hoban’s idea was that if it looked like a real horse and acted like real horse, his unit would have few new skills to learn. This worked well for the unit, and they quickly adapted to the Hoban Horses. The primary technology of the Hoban Horse was the use of a small graviton sphere in each mount, hence why only one unit was able to use these mounts. Hoban allegedly came across a quarry of graviton spheres, although skeptics doubt that the man just happened upon thousands of small baseball-sized graviton spheres. With the death of Hoban at the battle of Rykon Pass, the location was lost to history. For propulsion, the Hoban Horse uses an aether-infused thrust device that allows it to move vertically and side-to-side in any direction with small thrust jets on the flanks of the horse. When adjusting the speed throttle on the horse, the rider can freely activate the horse’s power thrusters to exceed its maximum movement speed per turn by up to 200 feet. However, the horse will take one point of wounds damage per turn when using its power thrusters. Hoban placed a bio-flux essence-reader into each of his “horses.” With these devices installed, no other person could ride the mount except for those whose genetic print were encrypted into the essence-reader’s memory banks. In addition, Hoban included an audio receptor that would allow each rider to recall his mount with a special whistle of his design. A simple clockwork analytical engine installed in the horse is all that is required for the horse to home in on the whistle’s location and fly straight towards it. With the use of their installed grappling-hooks, the horses can easily maintain pace with any airship they latch themselves to. To this day, scientists still don’t know how Hoban designed the Hoban Horse. Rumors hold that he used lost technology of the once continent-wide Haudi empire, while others claim he found one of the legendary vaults of the Lords Hazard, which held the rough blueprints. The validity of these claims is as circumspect as the history of Hoban himself. *Because of the unusual and rare nature of the Hoban Horse, they aren’t very useful to most people. They can truly only be used for parts normally (which could still sell for 1600), though a collector might be willing to pay the full price for one. 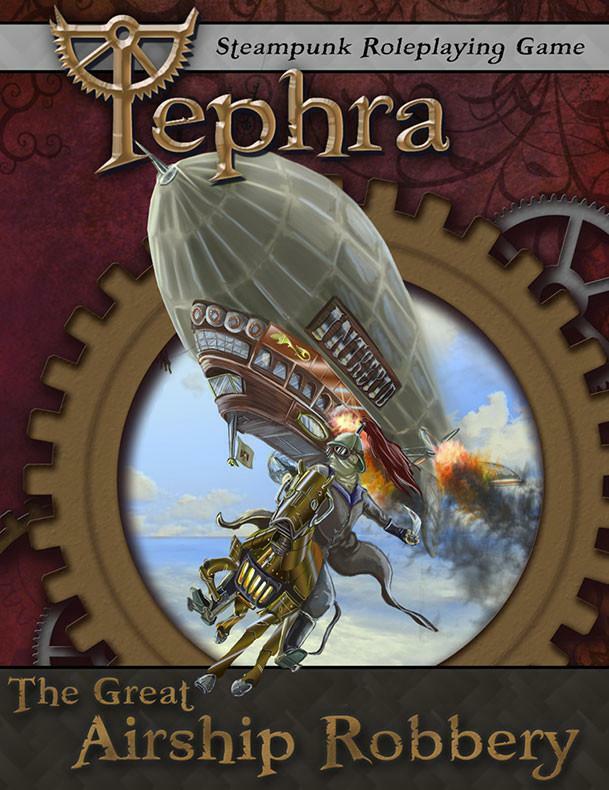 This mounts were used in the Tephra Adventure, The Great Airship Robbery. Check out the adventure to see them in use!